True Detective is a new TV show on HBO with Matthew McConaughey and Woody Harrelson in the leading roles. The story is set along the coastal plain of South Louisiana, where it follows a story a story about two detectives telling a story about a murder. However, this is not a regular crime TV show, it is a show more interested in those who solved the crime than who committed it. True Detective jumps between 1995, when its central murder investigation happened, and 2012, when both detectives reflect on the case. 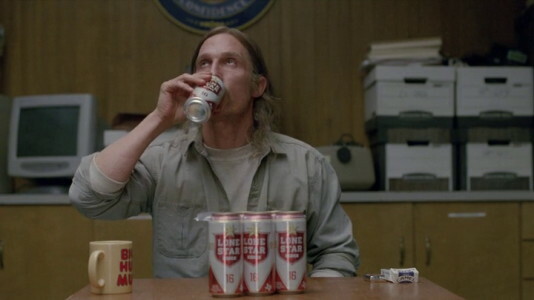 During the interview in the first season detective Rust Cohle (McConaughey) asked for the beer. “If you want to pick my brain, work a room, you buy me a cheeseburger and a Coke, don’t you? He got a six-pack of Lone Star beer, which originates from Texas, det. Cohle’s home state. Lone Star was visible during the interview in the episodes 2 and 3, as well as during det. Hart’s (Harrelson) visit to his wife’s parents. The Lone Star Brewery was built in 1884 in San Antonio and was the first large, mechanized brewery in Texas. Lone Star beer was the company’s main brand and was marketed as “The National Beer of Texas.” In 2000, the brewery was closed, but the brand was acquired by Pabst Brewing Company. 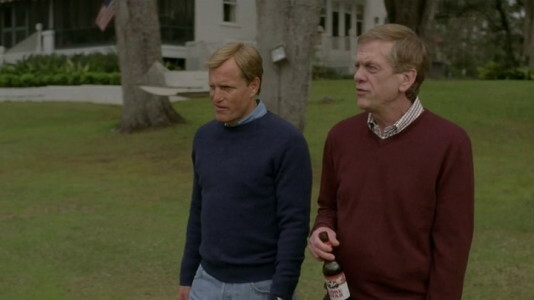 If we take into account the visibility of the brand and the on-screen time, Lone Star’s involvement in True Detective can be described as a very good product placement. There is of course a thin line between good and blatant placement, but the quality of the show, the lead performances and very smooth integration of the brand into the story made this placement a memorable one. yeah i doubt lone star is promoting their beer as the final stage in an awful relapse and the last resort of beer of said alkie. sorry. Yeah, real good product placement, the drink of choice for a alcoholic nihilist. Are proof readers with brains hard to come by or something? Where is Marnie's video for What I Am?